Warhammer 40,000 Kill Team (a game among our top 20 tabletop games of 2018) brought fast-paced skirmish battles to our table in 2018 and quickly emerged as one of our favorite games. Its strength lies in its speed and flexibility. Every faction in the Warhammer 40,000 model line is represented with numerous squad options available. Games are fast – roughly 45 minutes – and a robust campaign system lets you grow and tailor your forces to the ever-changing crucible of war. Expansions small and large followed the initial release and that doesn’t seem to be letting up in 2019. 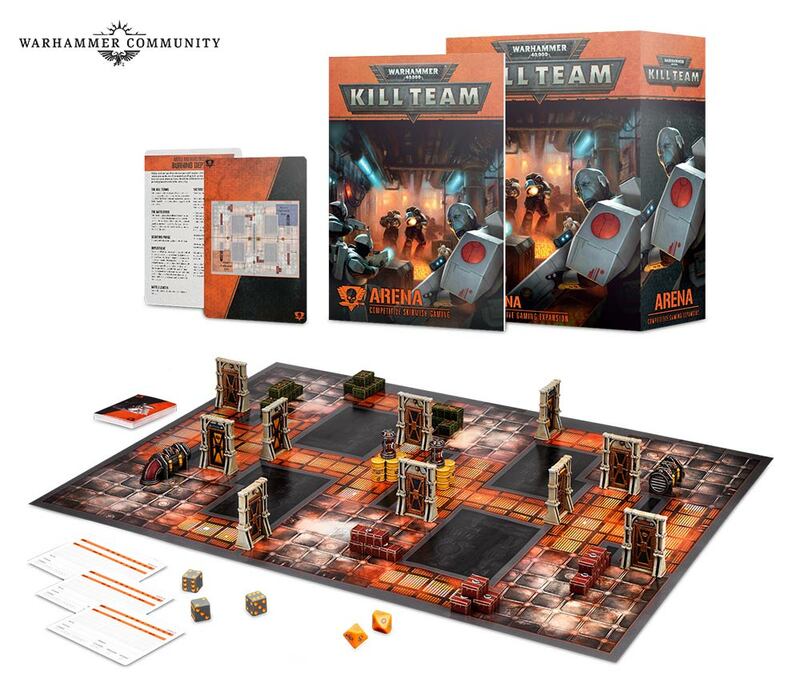 Games Workshop has announced Kill Team: Arena as an expansion for competitive tournaments. It condenses the multi-level open war battlegrounds of the base game into a claustrophobic firefight of narrow corridors and “ultra close combat” (UCC). If you’ve played last year’s Rogue Trader expansion you’ll be familiar with this significant wrinkle. UCC adds a new level of strategic depth by allowing players to react to the action in ways that emulate tense indoor firefights. The base game doesn’t offer the opportunity to react to a charging marauder who enters your field of vision towards the end of the charge; with UCC rules your shotgun-toting super warrior can unload and eliminate a threat as soon as its toothy maw rounds the corner or opens a bulkhead door. Perhaps the most significant change is the addition of Arena Objectives. All of the matched play objectives from the core rulebook have been retailored and balanced around the new Arena Board. In addition to the Missions Objective, players will select from a pool of special objectives that can be scored mid-round. In the same way that a Campaign Roster gives you the flexibility to adapt your forces to the opponent and mission, the Objective Cards will let you fine-tune your strategy in response to the situation on the board. I’ve enjoyed the Kill Team Campaign system and am looking forward to this new competitive element. The deck of Arena Objectives reminds me a bit of Games Workshop’s other skirmish game, Warhammer Underworlds. Short term objectives that inform a larger strategy is a significant element of Underworlds and I expect Arena will spend some time on my table. Kill Team Arena releases on February 2nd (and is available for preorder now). We’ll be sure to update you with more information when we get our power-armored hands on it.